I'm excited every month to discover what's in my design team box for My Creative Scrapbook and I stalk the mailman for my package. The new June kit made me squeee with happiness. It features Echo Park Paper's A Perfect Summer and it really is perfect! Our summers are filled with trips to the pool, sprayground, water park and beach. This kit was made for those photos; it has so many fun water-related papers and embellishments. This is Cory (left) with his good friend Owen poolside at our local water park, just splashing away. They were both 2 when this photo was taken. I tucked hidden journaling under the photo with a ribbon pull tab. I used a large journaling card (4x6) on the bottom left of the layout, placing it side by side with the photo. 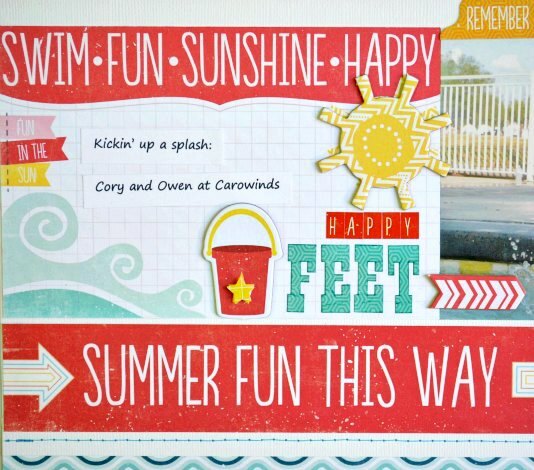 I added a couple lines of strip journaling, a chipboard sun and bucket and the title, Happy Feet. At the top, I added a small journaling card, embellished with summer icons and the photo date. 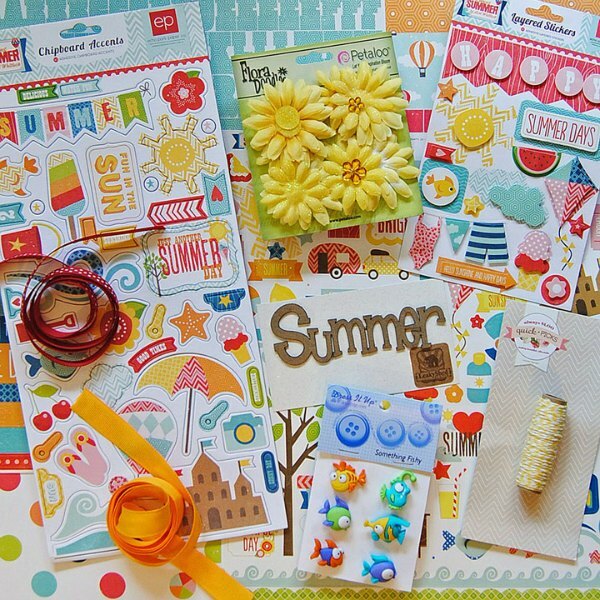 Here's a photo of the June Creative kit. 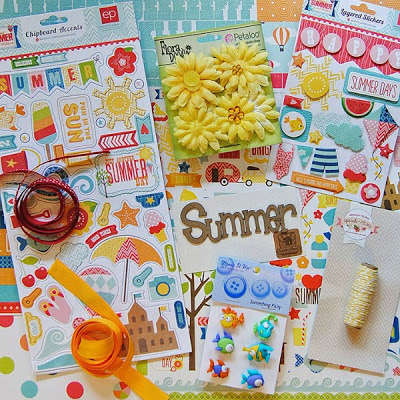 My Creative Scrapbook has 4 kits each month, each featuring different manufacturers. They are so well put together and are great buys. 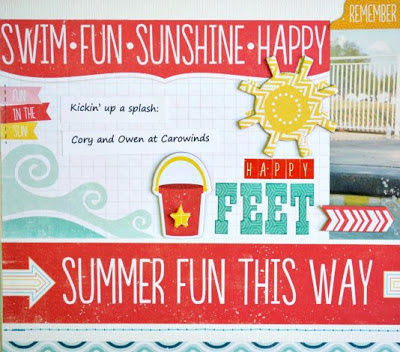 You can find all the details here on the My Creative Scrapbook home page. Thanks for stopping by. I'll be back on Friday with another layout from this kit. This is ADORABLE! I love the title and the way you did the hidden journaling. So cute. Such a refreshing design with the band of white, Izzy. I love how you used the journaling card and banner in that space. Soo adorable! I've been eyeing this collection...it's so on my wish list! This is adorable!! LOVING the colors, the photo and the flip flops!! SUPER cute, as always!!! We have such similar tastes it seems! Thanks for the inspiration! 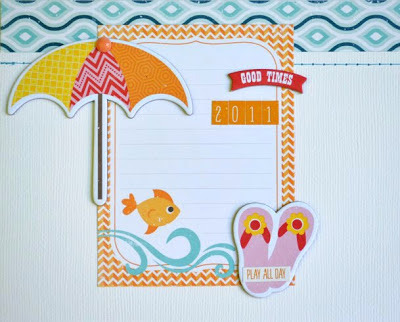 Adorable page Izzy, and perfect use of this fun Summer collection from EP!! izzy, this is truly awesome!! i love the scene you created!! Izzy you rock!! This is so so cute!! Bold and beautiful! Love this one too. Side by side in an album will look stiller:):):) Great work always Izzy!!! Thanks for the visits today!